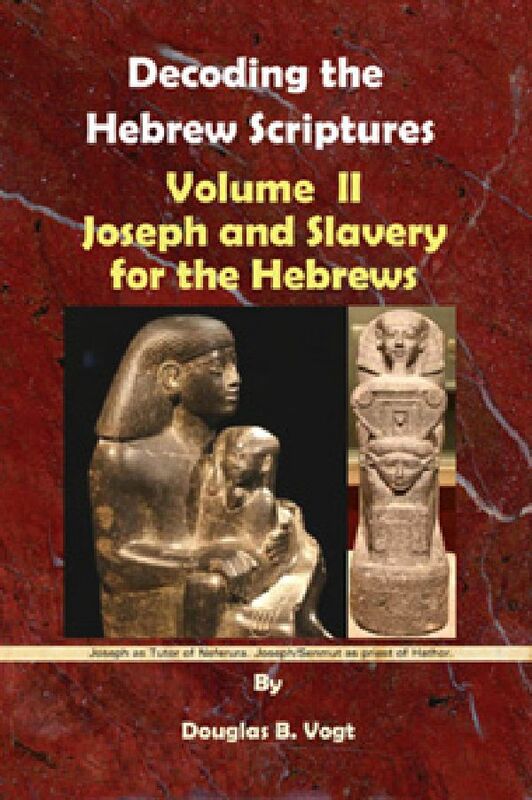 Volume II covers what really was the gift that Jacob gave Joseph, why Joseph’s brothers sold him into slavery and who Joseph was in Egypt. It also covers who was the person who purchased Joseph as a servant and plaything, why he chose the Egyptian Sanmut, what he did with some of the gold he received for the sale of the grain and where he put it. Also covers who were the Ephraimites and why did some of them morph into another tribal identity. Who was Aaron and Moses really related to, and finally why did eleven of the original twelve tribes become slaves. About 23 percent of Genesis is directly or indirectly about Joseph and what he did in Egypt. There is a very good reason for this. It is because of who Joseph was in Egypt and what he did as Prime Minister. It also answers why eleven of the twelve tribes went into slavery but not his two sons. By the end of the slavery period, when the Exodus occurred in 1306 b.c.e., there were only ten of the original eleven tribes left besides Joseph's two sons. You must ask the question why did Moses count the two sons as separate tribes. It should have been the tribe of Joseph. Everyone must ask that question. This Volume will answer why, plus may other unanswered questions about who Joseph had the affair with, what he did with most of the money he collected from the sale of the grain and who Aaron and Moses was really related to. One of the chapters explains what the idol was that Sarai stole from her father and that was the real gift Jacob gave Joseph—not a coat. On Egyptian history, the book covers who was the Pharaoh that made Joseph prime minister of Egypt, who was the Pharaoh who enslaved eleven of the Hebrew tribes and why the pharaoh did it. The author explains why Joseph told his brothers “God has made me father to pharaoh.” He was not kidding.